Shortly after a discussion of Hey Jude, and the Wilson Pickett cover that had just been released, George begins to discuss the songs he’s bringing to the rehearsals. “Thinking of all the tunes I’ve got, and they’re all slowish,” George says. “Most of mine are,” Paul agrees. Indeed, Paul had already introduced “Let it Be” earlier that day and the sessions closed with lengthy rehearsals of “Two of Us” the day before. Then George jumps in with something of a revelation, at least to these ears 43 years later. Taxman Part 2! What could that be?? The internet is pretty empty when it comes to references of this, a song called “Taxman Pt. 2.” The few informal references I’ve seen suggest the song is actually “Isn’t It a Pity” — based upon the two-second sample of the song George subsequently plays. I guess it could be that, if only because we know that George had brought the song to band initially during the Revolver sessions (we’ll learn that later on as we hear the tapes, in fact). The lone lyric he sings here — “When you’re smiling” — doesn’t necessarily lead to that, though. I’ve also seen that it could be “Art of Dying,” since that also dates back to 1966. The only two songs he even uses the word “smiling,” at least as far as Google is concerned, are “Behind the Locked Door” and “Soft-Hearted Hana.” And they could be easily dismissed — the former since it was about Bob Dylan written just a few months earlier, and the latter since George himself said he wrote it in 1978. George himself is the source of both those facts in I Me Mine. 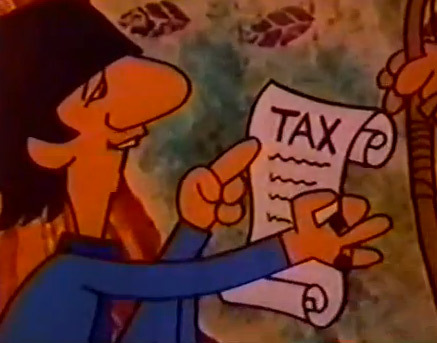 Whichever song it is, the “Taxman” reference is probably by topical association only, since none of the possibilities are remotely anything like Revolver’s leadoff track. Meanwhile, George continues to the band’s longtime bassist and drummer. “So far there’s only a couple I know I could do live with no backing. And that’s one of them. They then move onto a take of All Things Must Pass.